Marvel and Littlebits have teamed up to make a cool new product called the Inventor Kit. This kit is a mixture of programmable bits that lets kid learn about circuits, in-app coding, LED light design, sound effects. The toy also allows the children to customize a lot of these things and use their own creativity. Toys like this are great because they give enough freedom for the child to pursue their own passions, while giving a road map for them to learn advanced skills. The inventor kit is not cheap its current retail price is $150. Watch the video and read press release below to see if you think it would be worth it. I tend to think this is a great kit to buy for a kid who likes super heroes over the age of 8. I hope to get my hands on one of these and test them with my own children so I can provide a full review. For now all I can say is that it looks really cool and promising. As a member of the Amazon affiliate program Toylab creates links directly to Amazon on our site. That lets highlight cool items that you might be interested in like these STEAM toys below. We buy our kids lots of things, but I always hope among all of this stuff we buy are things that really enlighten them and make them think. Perhaps the best items are those that can actually teach a whole skill set. Here are some of the things we found on Amazon that our bloggers liked. 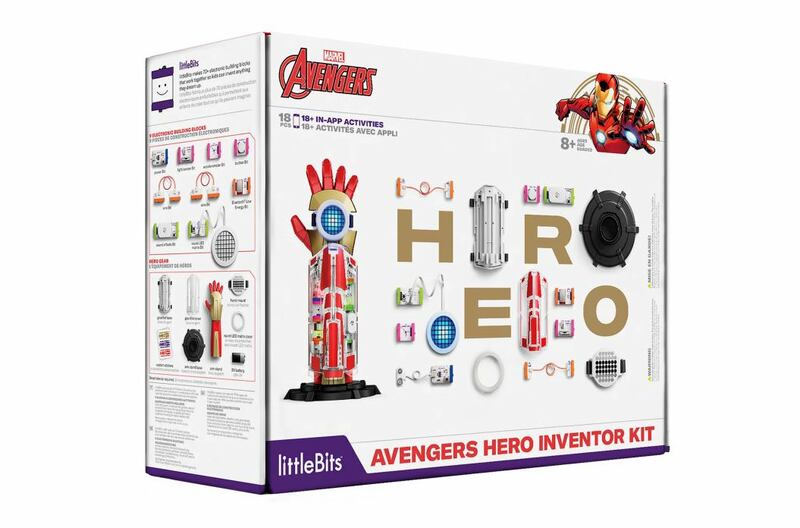 New York – August 1, 2018 – littleBits, the inventor of the electronic building block, today introduced the Avengers Hero Inventor Kit in collaboration with Marvel Entertainment, LLC. 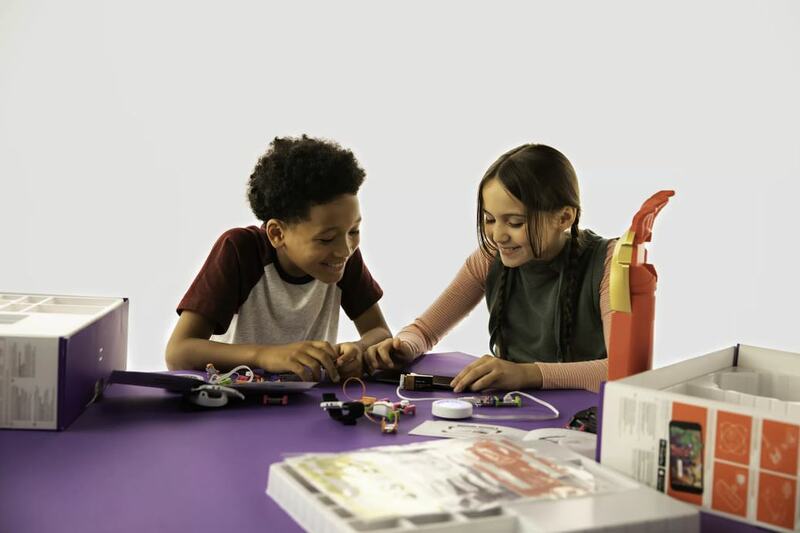 The new kit allows kids to create and customize high-tech hero gear and a unique Super Hero identity using littleBits electronic blocks. “Inventors, Assemble!” will be kids’ new battlecry as they build their own high-tech hero gauntlet with wearable tech sensors, in-app block coding, a customizable LED matrix light design, and authentic Marvel Avengers sound effects. Marvel Avengers including Iron Man, The Hulk, Black Widow, Black Panther, and Shuri, then guide them through “hero training” in the free Avengers Hero Inventor app, which includes step-by-step instructions and video tutorials for more than 18 in-app activities. By completing activities around light, speed, stealth, sound, coding, and unique hero identity, kids unleash their creativity and imagine their own invention super powers. The Avengers Hero Inventor Kit includes everything kids need to create their own super powers with electronic building blocks, then reconfigure them in different ways to create new inventions: nine Bits, seven hero gear parts, two sticker sheets, and the free littleBits Avengers Hero Inventor app. It follows the success of the Droid Inventor Kit, which won The Toy Association’s 2018 Creative Toy of the Year and was named to several of the toy industry’s most prestigious “hot toy” lists, including TTPM’s “Most Wanted” and the Toy Insider™ “STEM 10.” The Avengers Hero Inventor Kit is currently available for preorder on the littleBits website and Amazon. Available in the United States, Canada, Germany, United Kingdom, Spain, France, Italy, Australia, and New Zealand, the Avengers Hero Inventor Kit will begin shipping August 24, 2018. Look for it on Amazon.com, in Disney Stores, and at littleBits.com. Suggested retail price is $149.99 USD.